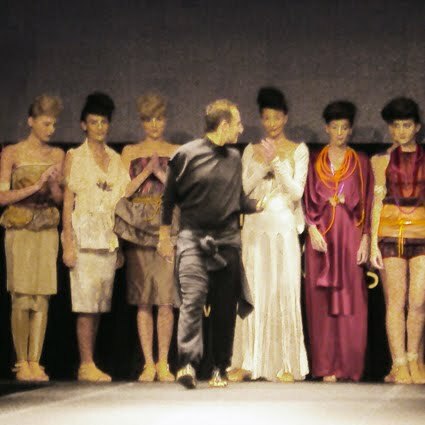 Ioannis Guia presented his Spring-Summer 2011 collection on Saturday, October 23rd at Athens Xclusive Designers Week. Dainty and delicate as always, Guia's creations this time were full of exotic ethnic references, mostly from Africa according to the designer himself, although I detected a bit of Japan as well in that obi belts and kimono style sleeves. However - as Elena very successfully observed - Guia managed to avoid all the usual clichés associated with tribal chic by using the most unexpected colours like lime green, lemon yellow, lilac and muted magenta in western fabrics like lace and taffeta interwoven with metallic threads. I also loved the hair and make-up. With their puffy up-dos and the dramatic finger-painted line down the middle of their faces, the models looked like early century colonists sucked into the tribal customs of their exotic new home. A small video of the finale. Moving picture is not as beautiful as photography in my opinion, but essential to see how the clothes actually move. loved him! in my opinion this collection was far better than the previous one! mmmmm thats a really "cool" collection !and invitation too!i liked the make-up! Loving the colours of this collection - beautiful! it is a matter of proportions.